Mahaasura Daruka created havoc in the Universe and chased Devas from place to place like fire chased flies; the boon that he secured was that none among the Purushas or Males could destroy him nor Stree-Shakti per se too. Brahma and Vishnu accompanied by Devas in their Feminine Forms proved futile and they all approached Maha Deva for a possible solution to handle the crisis. Shiva smiled to Devi Parvati-the Adi Purusha and Prakriti in visual Forms- and asked Parvati to transfer an Amsha of Siva’s masculine Swarupa into her. Apparently, there was no visible transformation in the mutual entities of Shiva and Parvati as there was a veil of Maya all around and both Siva and Parvati were as quiet and unperturbed as ever. But Parvati entered Shiva’s third eye full of extra- ordinary poison and having taken the required measure of it assumed a Rupa of a frightfully dark complexion. The Kaumari Shiva of feminine form got emerged in the process, throwing huge globes of fiery flames that could as well destroy the Totality! Danavas who accompanied Daruka had a mere glimpse of Kaumari Shiva and went helter-skelter as her mere smile thundered and thousands of them perished. The Kaumari Shakti sported a fiery third eye, with poison in her throat and a huge Trishula in the hands. Indeed it was a matter of time that Daruka fell down unconscious and got terminated out of sheer fright. The most hated and vicious Asura was thus put to rest for ever. But Kaumari’s anger was unabated and her looks got spread in different directions like wild fire destroying what ever came on way. With view to controlling her wrath, Bhagavan Shiva took the form of a Toddler whom she fondled and the breast milk that she gave the child sucked off her rage. From her temper and indigntation, she recovered a little and fell off into a stage of stupor. 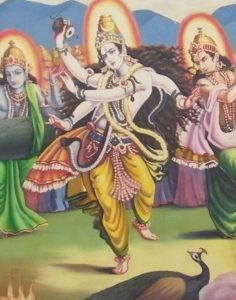 Having assumed his normal Form from that of a boy, Shiva performed a Tandava or a Cosmic Dance to ensure that Devi would recover from exhaustion and fatigue and get back to normalcy. From that unusual Tandava were materialised Ashta Kshetra- palakas who too got into the rhythm of Shiva Tandava. As she recovered from the frenzy a little, she also accompanied Shiva in his Tandava, which reverberated the Globe. Brahma, Indra and Devas hailed Maha Deva for his kindness in killing Daruka Daitya and brought back to balance in the Universe and relieved Devas from the atrocities of Daruka Daanava.